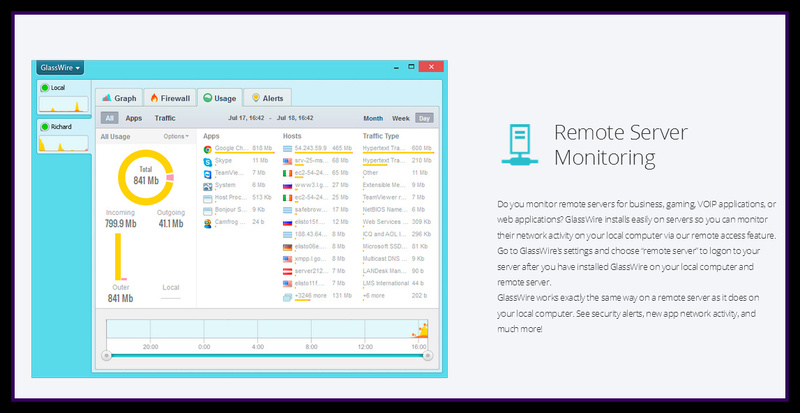 GlassWire is a free Windows application that I learned about from one of my kids. He’s much more technically ‘savvy’ than I am, and he ran across it in mid – 2014. He sent me a link to the forum discussion where he’d heard about it and I researched things a bit more, then I decided to download it and give it a try. At that point in time Glasswire was still being beta-tested, but I was convinced that the developers and their ideas were both credible and unique. Several years ago, my family’s home network was hacked. This led to an almost 2 year battle to regain control. This was a huge learning curve for me, but this was also the reason that I’m here today writing about tech topics I love and about how to use mobile technology. Our experience, while not common, wasn’t something entirely out of the either. In the end we figured out that our network was being used in a Botnet, probably (in our case) to send huge amounts of Spam. Slowly I got myself up to speed with Windows (first XP, then 7 & 8) and then networking. The end result was that eventually I gained the knowledge and skill I needed to keep our network safe and virus, malware and hacker free. Although I became well versed with Windows and we hired a service company to maintain our firewall, I still needed to monitor real-time activity on our network. This is where GlassWire excels!!! The technical details of networks are extremely complicated, and constantly changing. I realized that while it’s interesting for me to know about things like packets and sniffers, it isn’t really practical knowledge that I can utilize on a day to day basis for monitoring my network. What is useful however, is knowing exactly what my computer is doing as it communicates with the outside world. But that information is only useful if I understand it. GlassWire appeals to me aesthetically, because the user interface is so simple yet it’s simply beautiful too. It’s appeals to my easily distractable nature by providing me with snapshots that are useful and informative. If I need more information I can get more detail in several ways from right within the app. But that doesn’t take me long to accomplish either. If there’s information that the application displays that isn’t understandable to me, or complete enough, the user forum is easy to access, simple to navigate and so far I’ve found answers to all my questions almost immediately. Graph mode lets me see how my network bandwidth is being used. Primarily bandwidth used by my PC, but everything within the graphs is clickable so that oftentimes I see network activity from other devices on my network too. I haven’t explored this a lot, because I’m not usually worried about activity within my network, and bandwidth in general isn’t a big issue for me using a desktop PC at home. But what is really cool about the graph is that it provides data for the last 5 minutes, the last 3 hours, the last 24 hours, or the last week. By entering one of these time modes, you can click anywhere on the graph and see what exactly occurred then. Here are 2 examples of the last five minutes on my computer as I’m writing this article on WordPress. Firewall mode is more useful for my purposes. I’ve had situations where some action I took while online, or an odd site or message that’s popped up has concerned me. If anything even mildly concerning occurs…I immediately shutoff my internet connection by closing down the browser I’m using. But that doesn’t mean that things aren’t still happening behind the scene! Viruses could be downloading and installing, Cryptolocking malware could be encrypting my data. There are a lot of dangerous things that could potentially be happening that are very troublesome. Since I’ve begun using GlassWire, I’ve encountered maybe 3 or 4 unusual situations that arose. I’ve learned enough about Windows to really understand how to use the Task Manager (remember the old CTRL+ALT+DEL key combination from early Windows’ days?) By using that information along with the data that GlassWire gives me about active connections I feel I have enough information to be confident that everything is OK. Usually I can arrive at this in a very short span of time too. Without having to run virus scans, malware scans, etc. Firewall Mode interacts with Windows Firewall. It’s actually really cool to see the amount of fine-grained data that you can glean from it so quickly! 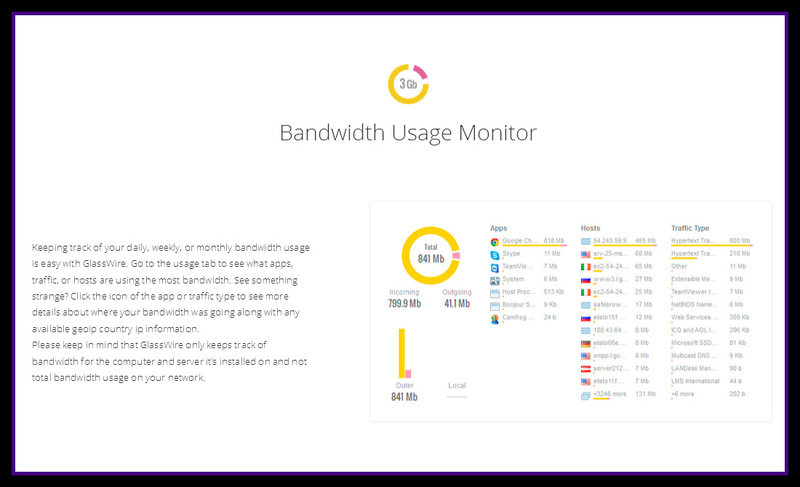 Usage mode is intended for monitoring everything related to bandwidth. What I think is so amazing about it is I can double click on any entry and have my antivirus software do any immediate scan of any data that was downloaded for viruses. I use this a lot when something suspicious occurs. 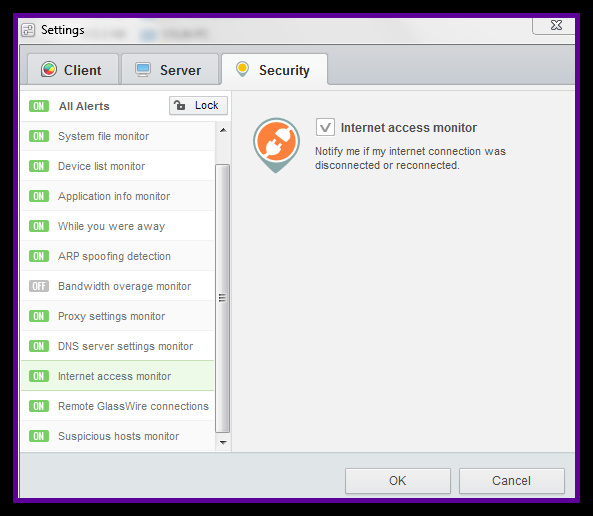 In this view you can see any alert that GlassWire generated. The alerts are user defined and controlled, and not annoying at all. By going into settings you can define what you want to be alerted about. You can also setup monitoring for when your computer is idle. I’ve only scratched the surface exploring the amount of information to be gleaned from these alerts. But so far, what I’ve learned has been so helpful. Because the software displays data to you in a ‘simple to understand’ format, this makes it extremely useful for the average computer user who doesn’t want or need to learn all the little details about networks and data exchange. Most people just want to explore the world wide web and to remain safe while doing so. Personally I think of GlassWire as a learning tool too, and for me, it’s a great one. It’s precisely because the user interface is so simple, and the user forum is so readily accessible, that it’s the perfect tool for both learning about networking and keeping your data safe. As an example of how well Glasswire is able to translate complicated data into actionable steps that everyone can follow, here’s a link to what they advise you to do if you suspect you may have just exposed your computer to a virus. A short time after I published this the folks at GlassWire released several new versions that are available for a onetime fee for purchase. GlassWire continues to update their free version as well as they continue to enhance and add features for higher level versions, so I’m including links to both the paid and the free options below. As of March 2017 Glasswire is not yet available for Mac computers, but this is something they say they are working on and should have available soon. 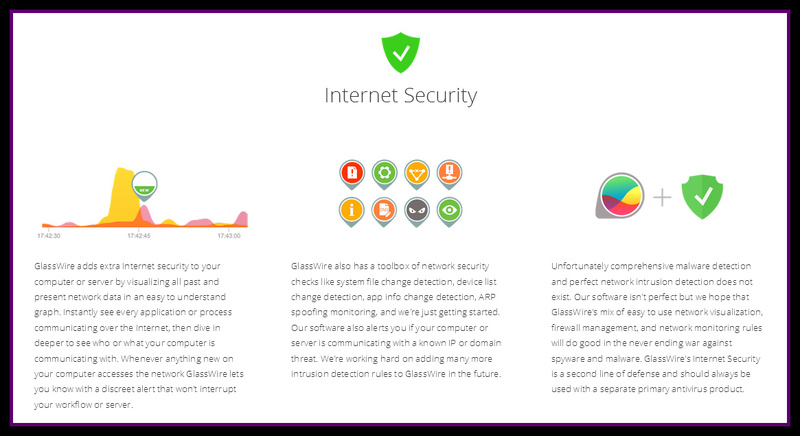 When I first started using a Glasswire it was in a beta version, but since then they’ve really developed the app and added a lot of new features which may or may not be useful to some users. So, thye’ve broken out some of the features that don’t impair the core functionality of the app and made them available as addons, I’m assuming to be able to keep offering their product for free to their larger user base. Here’s a link to their Paid plans and below is a screenshot which shows you the features available. I still haven’t explored every aspect of GlassWire in a great amount of detail. But I don’t need to, to be able to use it meaningfully…that’s what I love about it! But because it is so easy to use right from the start, I suspect that I’m forgetting to mention some of the features, that may be of real value to others. So here are a few more screenshots with more information. But I encourage you to use the links above to find out more too! 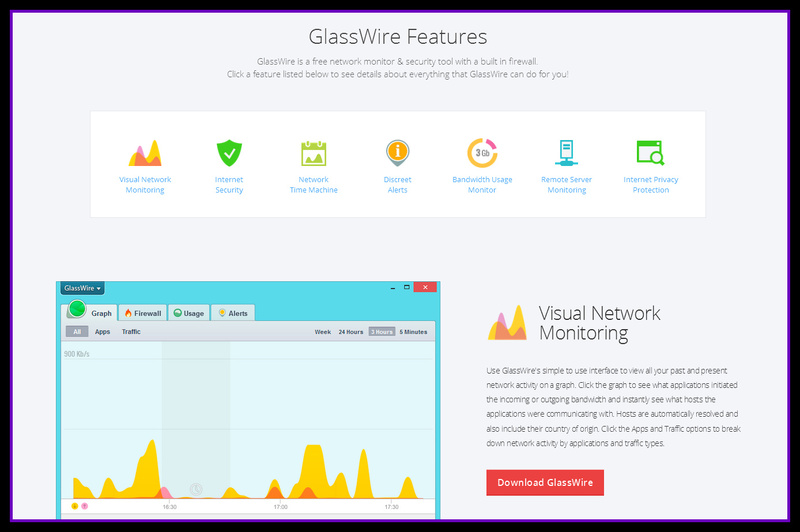 Please leave a comment if you have any helpful information to add about GlassWire or any other great tools for monitoring network activity. 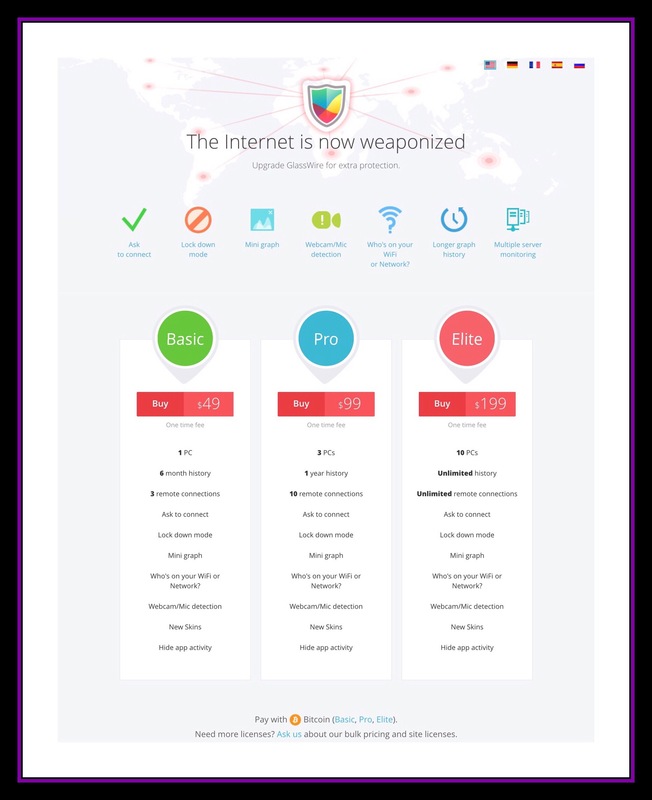 This entry was posted in Computers, General Technology Articles, Glasswire | Free App For Windows Lets You See Whats Happening Behind the Scenes with Network Usage, Network Tools, Security, Tech Topics and tagged Free Windows App, GlassWire, Network monitor, Network Security, Window's Firewall. Bookmark the permalink.